National History Day/Philly. Align your Civil War History Day projects with the annual themes of the National History Day competition. This site provides tips and links for teachers and students doing primary source research in southeastern Pennsylvania collections. Includes information on teacher workshops. Many Civil War History Consortium members are currently developing programming in preparation for the 150 anniversary commemoration. The following is a sampling of educational resources and programming currently available or in preparation. The African American Museum in Philadelphia has a teacher guide to its permanent exhibition, "Audacious Freedom." Chester County Historical Society offers K-12 teachers and students a variety of ways to access its collections and programs: on-site field trips to its West Chester facility, classroom outreach where a staff person comes to the school to teach an one hour program, traveling trunks of artifacts and documents teachers may rent for classroom use, and teacher workshops. For study of the Civil War era, there is a field trip, classroom outreach, and traveling trunk about the Underground Railroad, geared to the intermediate grades. In addition, there is a traveling trunk on the Civil War for secondary grades. Online curriculum materials on Abraham Lincoln and on the county's contribution to the war are planned for fall 2009. Historic Philadelphia is developing a set of in-class presentations on Underground Railroad and Civil War themes. The National Archives' Mid Atlantic Region facility in Philadelphia is an active supporter of education initiatives throughout the region. The Archives encourages educators and students to visit, research their microfilm and archival records, attend their public programs, and take advantage of their services. The National Constitution Center offers a lesson plan for middle- and high-school students, "Lincoln, the Constitution, and the Civil War," in addition to many other educational resources. The Civil War and Emancipation Studies Center at Temple University (CWEST) sponsors an annual conference every February. Participating faculty members are also available for lectures and presentations. Consult the Center's information page on Dr. Anthony Waskie's website. The Abraham Lincoln Foundation of the Union League of Philadelphia offers tours of the historic Union League building and ollection of Civil War related art and artifacts. An educational program is currently being piloted with high school students at Philadelphia's Mastery Charter School. The program uses primary documents from the League's collection to follow a boy's journey to manhood during the war and the League's unique role in supporting the cause of the Union in America's second revolution. Contact beardl@unionleague.org for more information. Start with the statewide site and explore the stories of people and the overviews of major topics, with abundant links to other resources. Educators will find the educational resources, and especially the Educator's Index linking site content and Civil War topics with the new statewide standards, particularly helpful. From the Philadelphia Area Consortium of Special Collections libraries, a collection of resources for researchers in southeastern Pennsylvania. These resources have been developed to guide students and other researchers to trusted sources based on southeastern Pennsylvania collections. For younger researchers, visit PhillyResearchNet's page on National History Day, as well as the National History Day/Philly web site. CivilWarPhilly audio tour. 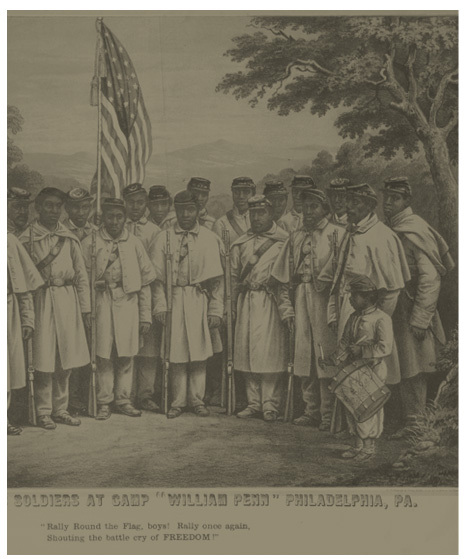 For some ideas on research topics, listen to some hidden Civil War Histories at Philadelphia historic sites.